In a nail-biting vote-counting ceremony that saw the lead change three times between the Volvo XC60, BMW 5-Series and Toyota Camry, the Swedish crossover pulled away in the closing moments to poll 294 votes and clinch the 2018 Japan Car of the Year. The XC60 finished some 52 votes clear of the strong finishing 5-Series and 62 ahead of the closest Japanese competitor, Toyota's Camry. The Suzuki Swift finished in 4th place, ahead of the Honda N-Box, Lexus LC, Alfa Romeo Giulia, Mazda CX-5, Citroen C3 and VW Tiguan. 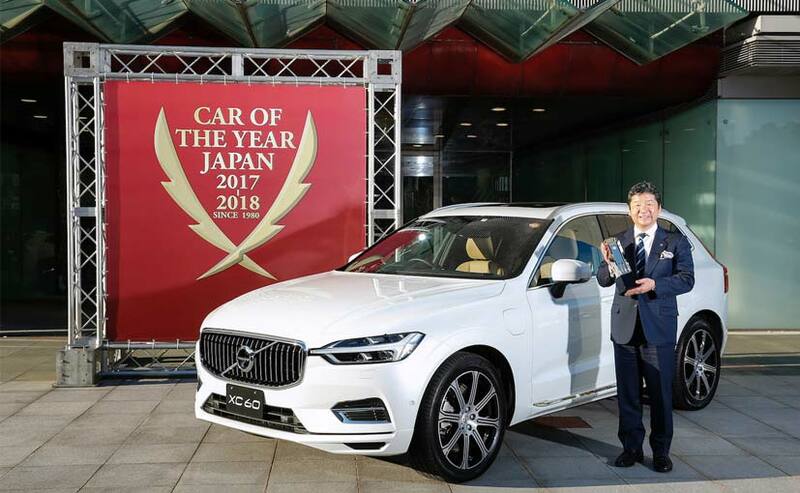 Accepting the trophy in front of 60 Car of the Year jurors and over 200 industry colleagues, Volvo Japan CEO Takayuki Kimura said, "This is the first time in Japan COTY's 38-year history that Volvo has won an award. To be honest, I would have been happy with the Import Car of the Year. But to come away with the overall Japan Car of the Year is totally unexpected and sincerely humbling. I dedicate this award to the 100 dealers and 1400 staff across the nation." In the special award categories, Toyota picked up a hat-trick of trophies; one for Best Innovation for its Prius PHEV, while the Lexus LC captured the Emotional Award. Then, in this, its 20th anniversary since launching the Prius hybrid, Toyota picked up the COTY steering committee's 'Special Achievement Award' for the brand's 10 millionth hybrid sale, a trophy Toyota executive chairman and first-gen Prius chief engineer Takeshi Uchiyamada was proud to receive. The Honda N-Box won the Small Mobility Award for being judged the best vehicle in Japan's unique 660cc class category.